The S742-X is a bi-directional, single-pole, single-throw, normally open multipurpose relay. 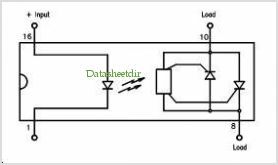 The circuit is composed of one LED on the input side which activates an optically coupled IC on the output - controlling the firing angle of two back-to-back SCRs This circuit assures no false triggering under most adverse conditions, and a tight zero-volt window not exceeding 5V. A 300-ohm input resistor in series with the LED is also provided in this circuit. This is one package pinout of S742-X,If you need more pinouts please download S742-X's pdf datasheet. S742-X circuits will be updated soon..., now you can download the pdf datasheet to check the circuits!